Black-throated Blue and Green Warblers and Bonaparte's and Laughing Gulls with Forsters Terns. Thumbnail Pencil Sketches by Ken Januski. First things first: I'm never much bothered by not getting into the Birds in Art Show in Wisconsin each year. Sour grapes you might say but you'd be wrong. At this point it's hard to even want to get in. The catalog, which is all I've seen since the museum was closed the one day I tried to see the show, is so disappointing year after year after year that I've lost my enthusiasm for either applying or being accepted. However I have been in two of the Society of Wildlife Artists Annual Exhibition in London, UK, in 2011 and 2012. Those shows I was excited to be in and would have been sorry not to have been in if I'd not been chosen. In fact I had no expectation whatever of actually being accepted. When I saw the video of last year's show, including the talk by David Attenborough I was doubly sorry that I hadn't applied for the 2013 show. There was only one reason that I didn't apply - the approximately $500 I paid in 2012 to have the works stored when they arrived in the UK until the official drop off days and then transported there and picked up again if they didn't sell. This did not include the shipping costs of about $100 each way that I decided I could live with. But a total bill nearing $1000 and no sales was just too much to pay for the prestige, and to me it surely was prestige, of showing at the annual exhibit. But this year I decided to try again. The reason is simple: there is nowhere in the US that I know of where I'd like to show my work. Birds in Art unfortunately is not the place for me. I wish it well but my reaction to the catalog year after year tells me how foolish it is to apply. On the other hand every time I see works from SWLA members and from the annual exhibit it's like a breath of fresh air. This is a show worth getting rejected from. It is a show worth trying harder to produce work that will be accepted. I don't at all feel that about Birds in Art. So to end this tangent I decided this year I would pay the extravagant prices to try to get in. That is until I learned that I now needed to have a Tax Representative in the UK in order to apply. I don't blame anyone for this. It is probably a necessary complexity of international trade and international exhibiting. But for someone like me it is just too much, in both monetary and bureaucratic costs. Today I got an email from the Mall Galleries where the show takes place. That included two links to the upcoming show for this year. SWLA Browse and Buy shows work that can be bought online. In addition the SWLA 2014 Online Catalog can be seen at the second link. This is what wildlife art can and should be, at least to me. I wouldn't mind getting rejected from a show like this. The director of the Leigh Yawkey Woodson Art Museum, which inaugurated and has hosted Birds in Art for years, recently suggested that artists who didn't get in needed to just work and try harder. I think this advice was well meant but I think it's just wrong. Some types of art will never get in and I wouldn't be surprised if many of the artists who do show in Birds in Art would not be accepted into the SWLA or their annual exhibit. Unfortunately for me the type of show I aspire to be in is thousands of mile and thousands of dollars away, though I'm sure the reverse is also true and there are some European artists who'd be much more comfortable with Birds in Art than with the SWLA Annual Exhibit. It is a sad truth. Now to my loafing. It might seem like I'm just not doing much artwork these days. 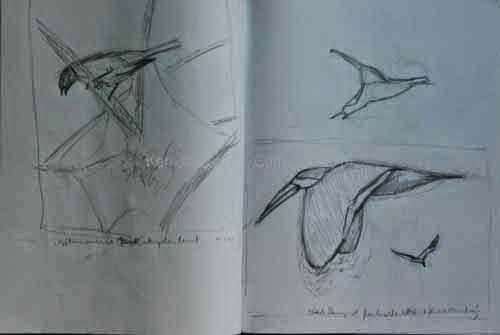 I am spending a lot of time birding and in doing so looking for subjects for new prints and paintings. I've really enjoyed all the sparrows I've seen recently and in particular all the Purple Finches. But I've also been looking through photos and sketchbooks for new subjects. I always do this and it's a time-intensive process, one where even I think I might be loafing. After you've done art for awhile I think that for many it is a constant change from contemplation and thought to work and back and forth again. Just working without much thought may work when you're younger but at some point I think that many artists don't want to repeat themselves and end up thinking about what they want to do next. But too much thought is bad as well, probably even worse, in that it can totally shut down an artist, like a deer in the headlights scared to go this way or that. Palm Warbler at Manayunk Canal. Watercolor by Ken Januski. Yes, everyone knows, and the lucky few appreciate the rich colors of fall. They seem a bit of a reward for the cold grays and browns that will be here soon. But occasionally you also find a bird that takes part in the rich splendor. Such is the case with the eastern race of the Palm Warbler. The western race is much duller. And the eastern race in spring is very bright. But there aren't too many more richly colored birds, outside of perhaps some ducks, at this time of year. As I walked along the Manayunk Canal and Schuylkill River this very brisk but sunny morning I decided to take a detour into a junky field, once an asphalt lot I think, that is now dominated by wild chamomile and who knows what other plants. Burs of some sort because I always leave covered in them. 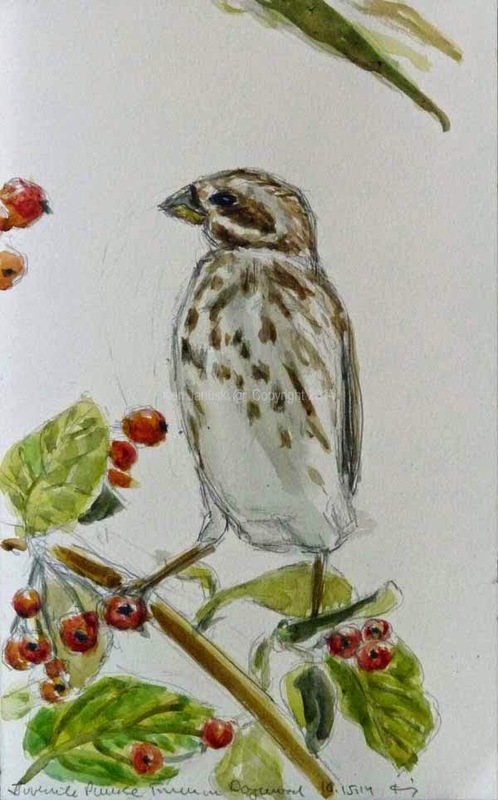 And sparrows. But rarely warblers. I don't think I've ever seen Palm Warblers there though this certainly is the time for them. In any case a good number of them were there amidst the very rich, orange, red, yellow and purple foliage. I took a number of photos and determined that when I got home I'd find the time to do a watercolor. Not a watercolor sketch this time, but a finished watercolor. It is 7x10 inches on Arches 140# cold press paper. I'm once again reminded that I think a well done watercolor is without a doubt the most difficult medium in two dimensions. It is so easy to turn it into mud. I was afraid many times that I'd done that here. 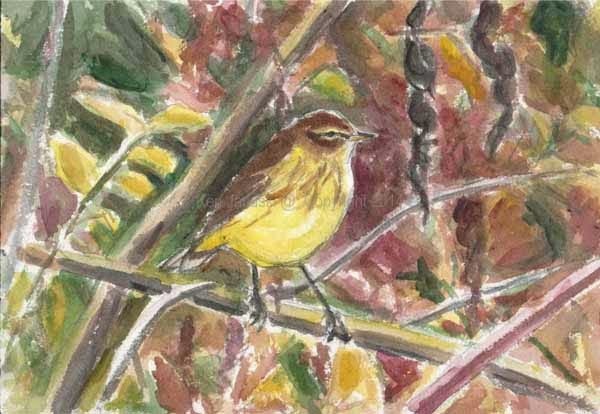 But I think in the end that I've gotten the rich colors of the foliage and the handsome Palm Warbler. Before I'd even gotten my binoculars out of the back of the car when I arrived this morning a mature Bald Eagle flew by, over the Schuylkill River. That I think was an omen that it would be a good day for birding and for art. Addendum. After I'd posted this I looked at watercolor again and noticed how much duller the actual watercolor looked. Part of this is due to the nature of viewing anything on a computer screen and the heightened brightness that occurs. But the rest was due I think to the drying of the watercolors. So this morning I scanned what I think is a more accurate, but slightly less rich, version of the watercolor. Dead Tree Along Kankakee River. Lithograph by Ken Januski. The recent sale of an older abstract work, Chesnut Park Number 16, along with the completion of a watercolor sketch of a juvenile Purple Finch based on a sighting last week reminded me of how much my art has often fluctuated between abstraction and naturalism and/or realism. In looking for a very old etching I did that married abstraction and naturalism to some extent I ran across the lithograph pictured above. 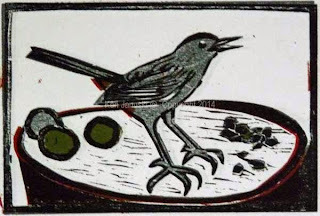 I've never formally studied woodblock or linoleum block printing, my current printing media. My first actual study of printmaking was in the basement of the UC Berkeley Student Union, thus the name of my etsy store berkeleySU, and the subject was lithography. Since I did strictly abstract art for so many years after getting my MA from Berkeley and only recently turned to naturalism I'm always a but surprised to see something like the print above. Obviously there is a realistic subject but I tried to hide it pretty well, concentrating instead of both composition and the process of lithography, experimenting to see what types of marks I could get. Still I did like the idea of combining the two. I hope that perhaps this explains a bit why I continue to stay away from naturalism that is particularly straightforward. Chestnut Park Number 16. Charcoal Drawing by Ken Januski. 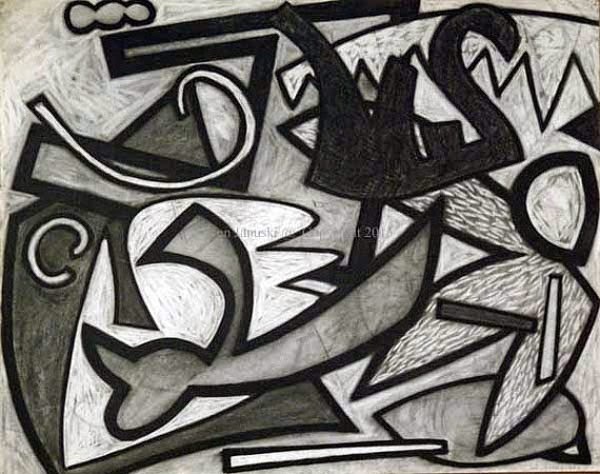 When I moved to Philadelphia around 30 years ago my first works were abstract charcoal drawings like the one pictured above. It's 23x29 inches and titled Chestnut Park Number 16. The entire series was called Chestnut Park, Chestnut because my studio was on Chestnut Street almost next door to the Ben Franklin Hotel, and park because I felt that my shapes were getting more organic, like critters you might see in a park. I've always liked this work even though I no longer work in this style. Because I'm still quite fond of it and think that it is of high quality I also have some of it for sale on a separate etsy store, OldAndAbstract. I was happily surprised to sell my first work from that store just recently. Juvenile Purple Finch in Dogwood. Watercolor Sketch by Ken Januski. As I've said here more than once before when I got disgusted with the contemporary art world and could no longer see a viable place for myself in it I eventually turned to naturalism, first insects found in the garden and drawn while viewed under a dissecting microscope and finally birds, in about 2006. 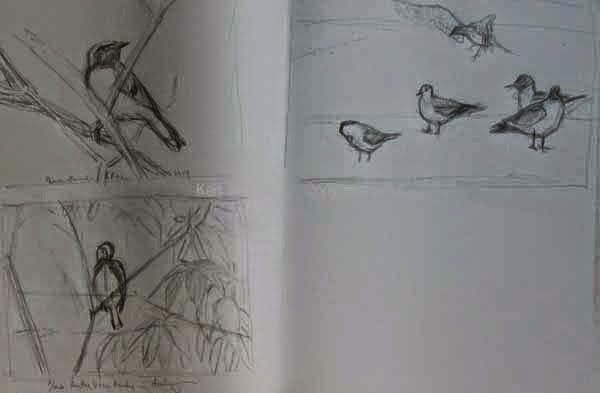 I quickly realized how little I knew about birds, even though I'd been birding for 10 years or so at that point. It has been a long struggle to be able to understand them and to be able to draw or paint them successfully. Soon after I started I realized I'd get nowhere working from photos and that I needed to work from life in order to truly understand birds. Easier said than done but I can say that today I'm at least somewhat comfortable working from life. And because of that I'm also more comfortable working from my own photos when there's a compelling need. The small watercolor sketch above is such an instance. We rarely see Purple Finches in Philadelphia. 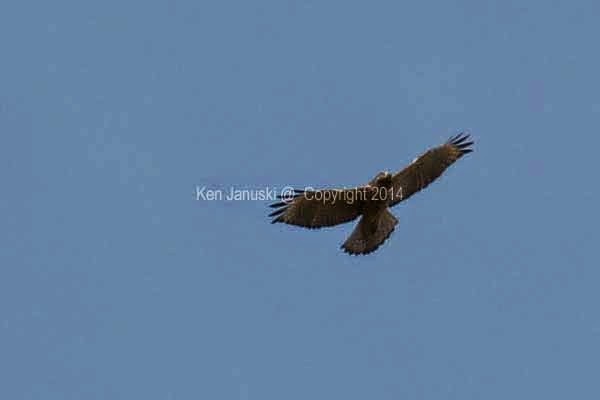 But last Sunday we saw four at the Andorra Natural Area, an adult male and female and two juveniles. I have to assume that they were a migrating family but that could easily be wrong. I wanted to be certain of their ID so I spent most of my time taking photos and one sketching. But the image stuck with me. I particularly was struck by the scruffy plumage of the juvenile above. So yesterday and today I did this watercolor and pencil sketch based on one of the photos. I'd like to do something that combines both adults and juvenile but that is a bit ambitious so I'm not sure when I'll actually take it up. When I do though, most likely once again I'll try to reconcile abstraction and naturalism. Who knows what might turn up? 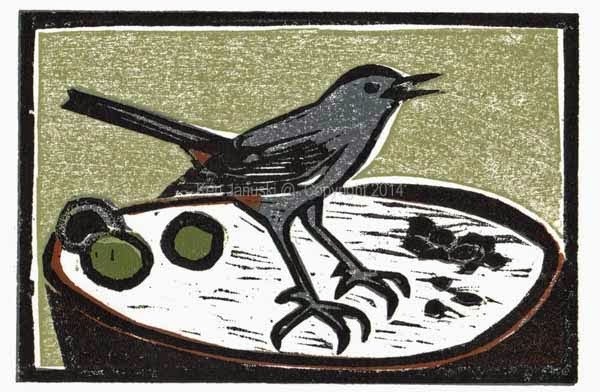 Gray Catbird with Walnuts Version I. Multi-block Woodcut by Ken Januski. Gray Catbird with Walnuts Version II. Multi-block Woodcut by Ken Januski. 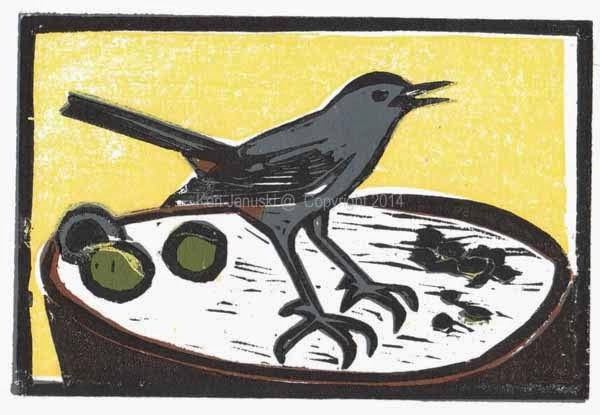 I really wasn't sure how I'd name the post with the final edition(s) of the Gray Catbird with Walnuts woodcut. But the excitement of seeing birds, especially hawks, in flight today at Houston Meadows provided the answer: Flight. I'm sure that there are many people who first get interested in birds through an admiration, perhaps even envy, of their ability to fly. I've never been one of those for better or worse, perhaps because I just have never seen all that many hawks in flight. But when you do see them soaring, like the juvenile Red-shouldered Hawk shown below, it is quite a sight. The sense of elegance, excitement, power is quite striking. So I determined that I'd call the post Flight. I suppose it's a good thing that I'm happy with the woodcuts. Otherwise I might have needed to try something like Dive. But I am happy with the results so the title stays. Juvenile Red-shouldered Hawk at Houston Meadows. Photo by Ken Januski. As I said previously I printed on two types of paper, partially because I had a half sheet of Rives Heavyweight to use up. Once I started experimenting with the background color I decided it made sense to make the 12 prints on Shin Torinoko paper one color, yellow, and the 6 prints on Rives Heavyweight another, sort of gray olive. I've always preferred the yellow one but there's also something that I like about the more subdued olive gray print. Both images are 4x6 inches and the entire print is 7x9 inches. They are now up for sale on my Etsy site(see link at right). I've also added some photos and an explanation of the process involved on my Facebook site(also in link at right). Gray Catbird with Walnuts. Two Versions State Four of Multi-block Woodcut by Ken Januski. I realized that my fear of a background that was too dull were coming true the other day so I decided to experiment with a third block for the background. I was already printing on two types of paper, Shin Torinoko and Rives Heavyweight so I decided to also try different background colors on each paper type. Originally I tried the yellow on proofing paper and I loved it. It seemed to liven up the print without taking away any of its simplicity. But when I added a bit of black to get a greener yellow and in fact got a very toned down green gray I still liked it. They are almost like a summer catbird and an autumn catbird. The real test will be when I print the first black block on top. The thin lines have broken numerous times so far as have the lines created with wood putty to replace them, also multiple times. So I feel like I'm Kurt Gibson trying to limp into home plate in the World Series many years ago. If I can only hold that black block together long enough to finish the print!! It will be at least a day before I dare print on top of this since even today the underlying ink was a bit wet. So perhaps it's time for a drawing with a brush break tomorrow. Time will tell. 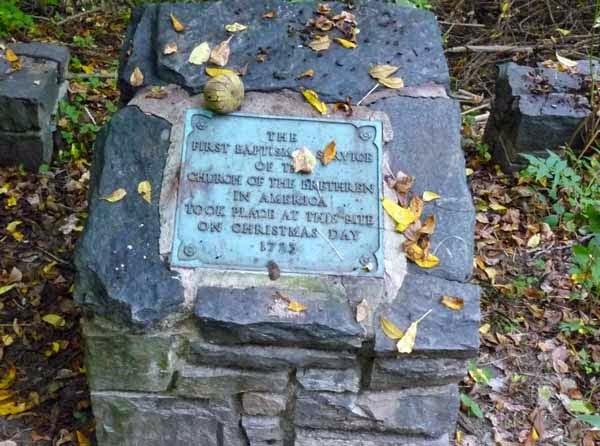 Baptismal Marker from 1723 along Wissahickon. Photo by Ken Januski. When I quickly sketched the Gray Catbird who is the subject of my woodcut in progress I didn't really pay much attention to what he was standing on while he closely guarded his walnuts. I just tried to capture the pose of the bird. Today I happened to pass by the exact same area, with at least one walnut still in place but no Gray Catbird. I was quite surprised to see what I eventually made the stump of a tree in the print was actually a very old historical marker, from 1723 no less!! Well my apologies to history and historical markers but I think that the tree trunk works better in the woodcut below. Still it is, at least to me, a thoughtful moment when I happen upon something that refers to events of 300 years ago. Of course the metamorphic rocks that litter the Wissahickon are just a bit older. How about 500 million years?! That is the claim of this study. It can be a humbling experience to see rocks that were formed that long ago. Gray Catbird with Walnuts. 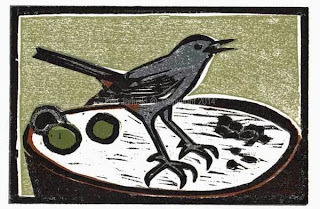 Multi-block Woodcut Proof by Ken Januski. Today I proofed the third color of the woodblock, not counting the black that will go on top. Anyone who is familiar with Gray Catbirds will know that their undertail coverts are a brilliant rusty brown, in stark contrast to the charcoal gray of most of the rest of their body. From the first I planned on incorporating that into the print. Later I decided that I might also use it in the tree trunk/ex-historical marker. This is just a proof on earlier copier paper proofs. But it is getting closer. Once I decide on whether to change the color or shape of this color then I'll proceed to print the black on top of everything. Hopefully it will hold everything together. And I hope as well that it won't be too dull. I didn't remove the background thoroughly in the fairly recent crouching green heron print thinking that it might add to the print. When I discovered in the process that a plain background would be better it was too late. So almost from the first I've decided to keep this background plain, just the color of the paper. Time will tell whether that will work or leave the print looking flat and dull. The morning after posting this I did a quick proof of the black block on top of the proofs from the colored blocks. So the final print will probably look somewhat like this. There is a lot of sloppiness in the proofs that will disappear to a large extent in the final print. For now I'm just trying to sort through the final decisions on color and shape. And of course the possible problem of the background just being too dull. Chicken of the Woods Tree Fungus. Photo by Ken Januski. But dullness is not a problem in the photo above. I ran across this scene today along the Wissahickon as well. What a brilliant orange. I confess I know little about mushrooms and fungi. 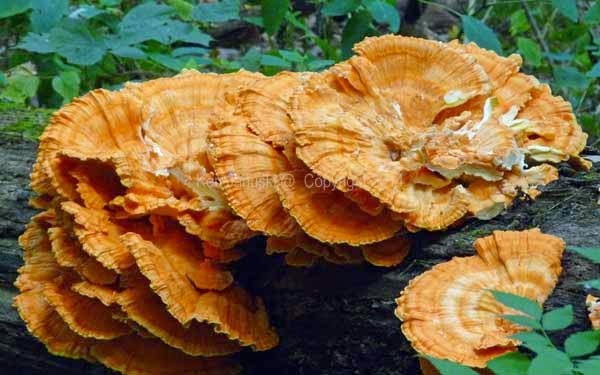 But a quick search for 'bright, orange tree fungi' when I got home convinced me that this is what is known as Chicken of the Woods mushroom, I assume because it tastes like chicken. Well as I said I know nothing about mushrooms so we're not having it for supper tonight. But you can't help but admire it for its visual beauty. On a cloudy day like today it was a burst of sunshine in the dark green foliage of the vegetation and the dark black of a fallen tree. Gray Catbird with Walnuts. Early Proof of Multi-block Woodcut by Ken Januski. 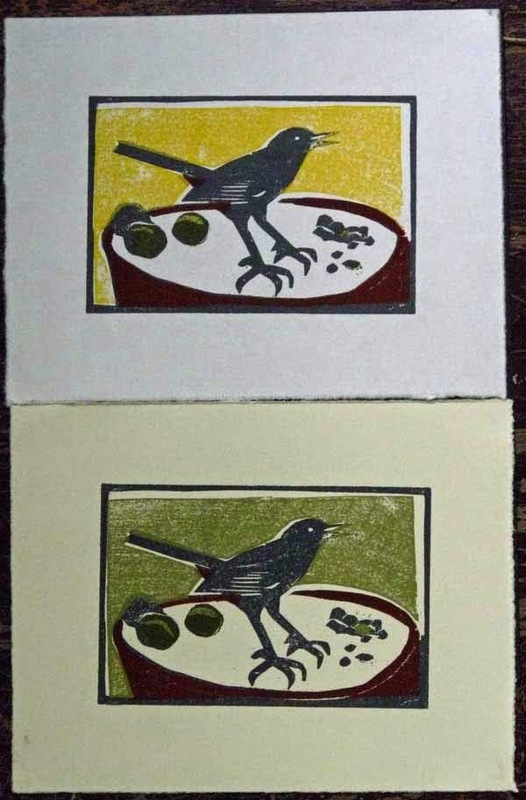 That's the lot of the printmaker, even a part-time one like myself. No matter what you do it turns out Picture Perfect. Well not quite. I've always been a bit scared off of printmaking and printmakers I think because there seems to be far too much concern with technique in the field, almost like an arcane religion. 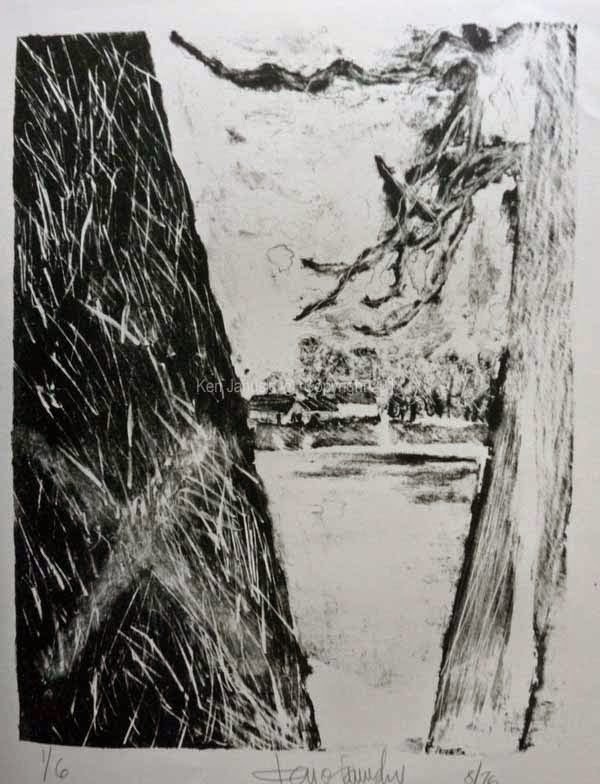 But the thing is that there are just so many things that can go wrong with printmaking that it's easy to become concerned with technique. I've already run into two of them with this print. First because I've used a black block composed primarily of thin outlines to tie everything together there's always the possibility that one of those thin lines will break, and end up lost on the floor with all the other intentional cuttings. That happened not just once but FOUR times! I think I know why but I won't go into details. It has meant finding a way to repair the lines. A second problem involved inking up just a small area of the woodblock, for instance the green of the walnuts. Sometimes I can just ink up the entire block knowing that some areas will be covered by a second color. That is the case with the gray here. I printed the entire second block in gray. There is one area where I would have preferred not to have the gray underneath, since it will affect whatever color is printed on top of it, but I decided I could live with it. Sometimes I'll print the color and then wipe off areas that shouldn't get that color with a rag before I place the print on top and rub the ink into it. That was a possibility here with the green walnuts. But I didn't think I'd be able to clean up the aberrant green successfully. So instead I tried a stencil or mask. This is something I've experimented with before but not too successfully. In any case I tried it here by cutting out a section of mylar the same size as the print. The result is above on a trial proof. I'm still deciding whether I can live with it or should redo it before I print it on the actual edition. So as you can see it's sometimes easy to get lost in technique when it comes to prints. I really try to stay away from it as much as possible. To me it never adds anything to a print. But it may help save a print, i.e. repair one. When I print I experiment quite a bit on the way to the final edition. In the 4x6 (7x9 with border) proof above I first printed the second block, which will have all of the colors, in gray. I then printed the first block, consisting mainly of black lines, on top of it. After I'd cut the stencil I decided to print the green of the second block on top. This won't happen when I make the actual print. But for now I just wanted to get a quick look at what it might look like. The black lines, at least as far as my picture perfect plan foresees it, will be printed on top of everything else. So here there would be a black outline around the green walnuts instead of underneath the green. In the end there's a lot of imagination and guesswork involved. I'm guessing what all of this will look like when I'm done. Of course it won't turn out that way, or is very unlikely to, and I'll then need to improvise. And perhaps I'll have to resort to technique once more to salvage what I've done. If that doesn't work there's always rationalization. In other news sparrows and butterflies seem to be the most exciting visitors in the natural world right now. I'd love to have the time to do and show some artwork based on them but that will just have to wait.